GREAT BEND, Kan. – The Seward County volleyball team traveled to Great Bend to open up KJCCC play against Barton. After losing the first set, the Lady Saints (5-0, 1-0) handled the Cougars (4-1, 0-1) in the remaining three to win the match, 3-1. Following an hour delay, the Lady Saints started off rusty, giving Barton three of their first four points in the first set. With the crowd on their side, the Cougars stayed ahead of the Lady Saints for the majority of the set. It wasn’t until 19-19 that the Lady Saints were able to gain an advantage. Seward scored three straight points with a kill and block by Luz Sierra to take a 22-19 lead. The lead proved to be too little as the Cougars stormed back to tie the set at 24. The two teams traded points for the next 14 points, before Barton took the set 33-31 following two Seward errors. Following the first set riddled with errors, the Lady Saints bounced back in the next three sets to prove why they’re the 18th ranked team in the nation. Set two started with the Lady Saints jumping out to an 8-3 lead. Two more Sierra blocks and kills by Viviane Viana and Giovanna Tapigliani led the charge. Seward went on to score the next five points before Barton would respond. Leading 13-4, the Lady Saints advantage was too much for the Cougars to handle, as Seward won the second set 25-12. The third set started much like the first set, as the teams traded points for the first 17 points. After leading 9-8, the Lady Saints scored 16 of the next 22 points to win the set 25-14. During that span Briana Domino recorded three kills, while Viana, Tapigliani and Sierra all added three more to their total. Barton stayed in the final set for as long as they could, but with the crowd dwindling and momentum on Seward’s side, the Lady Saints proved to be too much. The Lady Saints traded points with the Cougars until the score was 9-7. At that point, Seward took control of the match, winning 16 of the next 19 points to win the set 25-10. After having 19 errors in the first set, the Lady Saints had only nine the remainder of the match. Four Lady Saints, Domino (10), Mariana Nascimento (10), Tapigliani (14) and Viana (15), had double digit kills. 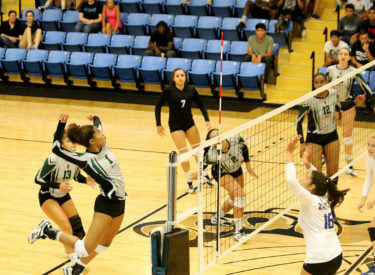 In the final set, the Lady Saints connected on 19 of 30 attempts for a .533 hitting percentage. Giovanna Kuntze put the Lady Saints in position all day with 53 assists, the most by a Lady Saint since Alyssa Olson had 56 in 2012. On the defensive side, the Cougars couldn’t find a way around Sierra. She ended the match with 7 blocks. To go along with her 10 kills, Domino led the team with 24 digs. Four other Lady Saints had double digit digs, Kuntze (10), Nathiellen Machado (19), Tapigliani (17) and Viana (13). This was Viana’s third 10/10 match of the season in only the fifth match. After playing five games in four days, the Lady Saints welcome a nine-day break. Seward will be back in action against Garden City on September 6 at 6:30 p.m. in the Greenhouse. For more information on the Seward County volleyball team, visit SewardSaints.com.